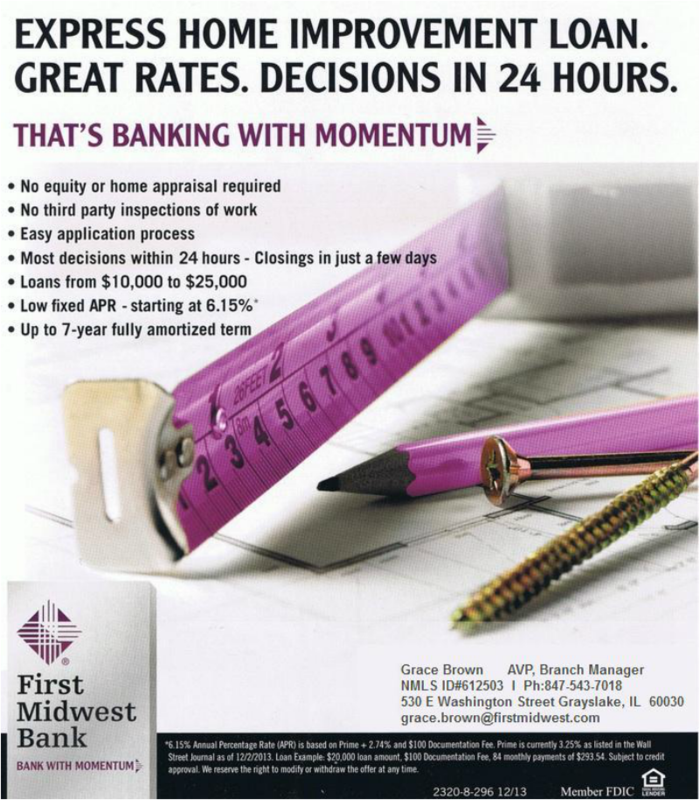 Hilliard Builders & Remodeling is partnering with ﻿First Midwest Bank﻿ in Grayslake to help you prepare financially for your home improvement project. Updating your kitchen or bath, or even finishing your basement? If home improvements are in your plans, First Midwest has the perfect borrowing solution. Not enough equity in your home to fund your dream home improvements? Forget those high interest rate credit cards. Our unsecured Express Home Improvement Loan has rates as low as 6.15% APR* to keep your project on budget. Plus the application process is easy, with most decisions within just 24 hours and closings in as little as a few days. We're here to help you get your project started fast. With the power to borrow $10,000 - $25,000 for up to 7 years, you'll have the money, plus the payment flexibility to help your home makeover be everything you want it to.